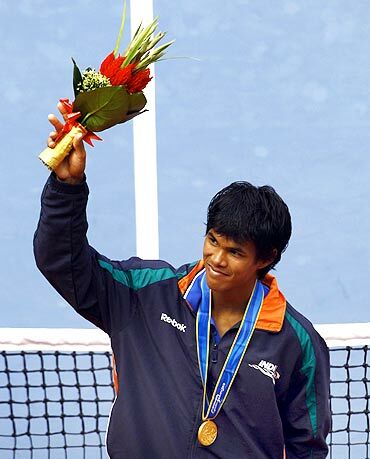 Somdev Devvarman became the first Indian to win a gold in Tennis in the Asian Games singles event. He also became the first Indian to win two gold medals in Asian games history. Just a month ago he had won Gold in the Commonwealth games, also becoming the first Indian to do so. This has been a brilliant year for Somdev as he broke into the top 100 for the first time in his career and also has won 2 gold medals in two major events representing India. He had also led India to the world group in Davis cup earlier this year. History beckoned Somdev when he stepped on the court in the finals against Uzbekistan’s Dennis Istomin who is ranked 44 in the world and the Indian ace did not disappoint. It was a lopsided final as the Indian won it comfortably with a score line of 6-1, 6-2. The win gave Somdev his second gold in the Asian games to go with 1 bronze which he had won earlier in the team event. A brilliant year for a fantastic player and I hope that he can repeat the same success in the world events in the coming year. With this brilliant performance Somdev has for sure become India’s “Golden Man”.